I really like vinyl records. And I mean like, a lot. Most of my extra spending money goes to adding to my collection. I’m not typically a very organized person, but I have several spreadsheets cataloging my records, all sorted in different arrangements. I run a vinyl blog where I review every record I have in order. The only thing keeping me from starting a video review blog is all the headaches I expect from getting flagged on YouTube over copyright issues. But for all the talk of vinyl’s superiority as a medium, it has one weakness: dust. Much of the Collector’s time is spent trying to fight the spread of dust. Most audiophiles have an arsenal of anti-static microfiber brushes, poly sleeves, after-market inner sleeves, and more. The more serious audiophiles employ even bigger guns. There is a large market of vinyl record cleaning systems designed for deep cleans. Some of these units cost as much as $4,000—and people actually buy them, which should tell you how serious we are about clean vinyl. Not all of us can afford to spend the price of a used car on a record cleaning system. But fortunately, there are much cheaper options. 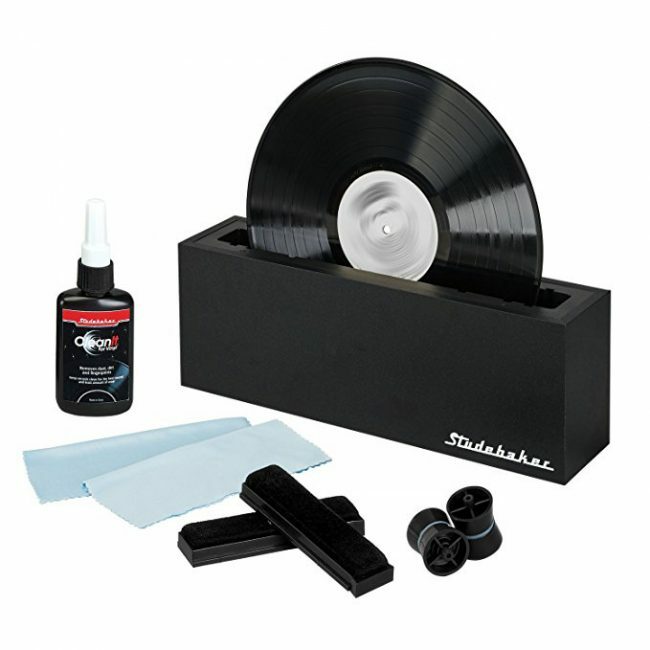 Enter the Studebaker SB-450 vinyl record cleaning system. I’ve been looking for a good record cleaner for a while, but I’d largely given up due to the high prices. But with a list price of $39.95, the SB-450 caught my eye. It also helps that I live in South Bend, IN, the home of Studebaker automobiles, so the name and the vintage styling were a definite plus. The body of the unit is made of sturdy MDF, wrapped in black PVC. I had expected it to be made of lightweight plastic, so this was a welcome surprise. The kit includes two microfiber towels, two microfiber brushes, a bottle of cleaning solution, and two small wheels for rolling the records. There is also a flimsy plastic cover that fits over the opening. The wheels drop into the base via three pairs of slots. The different slots allow the system to fit 12″, 10″, or 7″ records without a problem. You wet the brushes with the cleaning solution, then slide them into place in the center of the unit. The brushes have a tight fit, but not so tight that I feel like the record will be damaged. Per the instruction sheet, you put the record in place and rotate it six times, followed by six rotations the other direction. You remove the record carefully, then use the microfiber towel to dry the record off. Note: it is very important that you never, ever play a wet record. This will damage the record. It sounds simple in theory, but in actual practice, there’s a little bit of a learning curve. It takes a bit of force to move the record between the brushes. The first couple passes, I felt like I might bend the disc. However, the base is nice and heavy, giving a firm support as you turn the records. But how are the results? Snappy aesthetics and ease of operation are nice, but none of that matters if it doesn’t actually work. So how does the Studebaker SB-450 do? For a test run, I took my used copy of The Hawk is Howling by Mogwai. It’s a great record, but I hardly listen to it. The previous owner didn’t take the best care of it, so it’s crackled and popped with dust and dirt. I’ve tried to give it a good clean with the cleaning brush I already had, but it came up lacking. I readied the cleaner and took the record out. I wet the brushes, rotated the record, and dried it with the towels. I placed it on my turntable, dropped the needle, and listened. While it was certainly better, there was still plenty of dust noise on the record. I was undoubtedly disappointed, but the truth is that this system isn’t meant to give a thorough deep clean. It’s made to strip away surface dust that a microfiber brush will miss. To that end, it’s a great success. I’ve used it on some less severe records, and it’s made a huge difference. But for those more stubborn discs, this isn’t a substitute for a deep cleaning by hand. The Studebaker SB-450 retails for $39.95 and it is available on Amazon [affiliate link]. What I Like: Looks great. The components are sturdy and feel well-made. Good performance for the price. What Needs Improvement: A better cover than the flimsy plastic would help protect the unit when not in use.